Acquired: Selected in the fifth round (38th overall) by the Eskimos in the 2012 CFL Draft. Contact extended on Feb 11, 2019. 2018: King has appeared in all 18 games this season and has four special teams tackles. King is also the club’s long snapper. 2017: In five games, King finished with one tackle. King also had one kickoff for 52 yards. 2016: In 12 games (12 starts), King started at long snapper and recorded one special teams tackle. Went on the 6-game injured list in Week 6. He was activated in Week 12. King played in both the Eastern Semi-Final and Final, recording one special teams tackle against Ottawa. 2015: In 18 games (18 starts), King recorded three special teams tackles. King started the West Final at long snapper and recorded a special teams tackle and collected a fumble recovery. 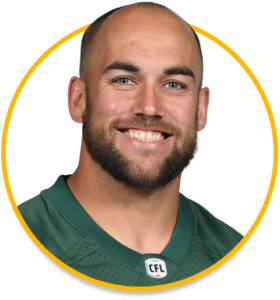 In the Grey Cup against Ottawa, King also started at long snapper. On October 13, he was awarded the David Boone Memorial Award in recognition of outstanding community service. 2014: In 18 games, King recorded nine special teams tackles and one forced fumble. He also played in the West Semi-Final against Saskatchewan and the West Final against Calgary. 2013: In 18 games, King recorded eight special teams tackles and recovered a forced fumble. 2012: In 15 games, King recorded seven special teams tackles. He recovered a fumble off a bobbled punt return against Saskatchewan on October 13. He was injured in that game and placed on the 9-game injured list for remainder of the season. College: In three seasons at Saint Mary’s University (2008-10), King was a CIS All-Conference linebacker. In 2010, he set a new school tackle record, tallying 114. Personal: King was born in Edmonton and grew up in Sherwood Park. He played for Bev Facey High School from 2001 to 2003. He followed up as an All-Canadian linebacker for the Edmonton Wildcats Junior Football Club from 2004 to 2007. In 2007, he recorded 169 defensive tackles, earning him CJFL Linebacker of the Year and CJFL Defensive Player of the Year. He is the older brother of Eskimos DB Neil King.